The purpose of this study was to identify any potential correlation between postoperative mortality and bowel resection in patients with obturator hernias. In total, 21 patients who underwent emergency surgery for a primary incarcerated obturator hernia during a 9-year period were retrospectively assessed regarding the correlation between postoperative mortality within 30 days from surgery and bowel resection. The 21 hernias occurred in 20 women and 1 man. The mean age at presentation was 83.3 years. 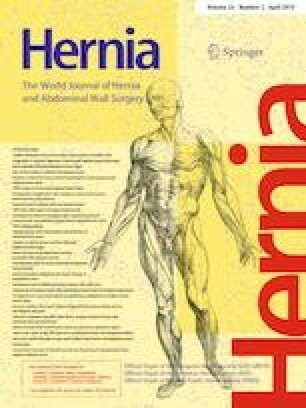 Eight hernias required bowel resection, and operations using mesh were performed for eight hernias. Complications occurred in association with nine hernias, and three patients died. Postoperative mortality was correlated with complications (p = 0.016) and bowel resection (p = 0.010). Patients undergoing bowel resection had a significantly longer operation time (p = 0.009) and a higher rate of postoperative complications (p = 0.018). The systolic blood pressure, pH, and base excess were significantly lower in patients who did than did not undergo bowel resection (p = 0.017, 0.009, and 0.015, respectively). As the aging population continues to expand, the number of patients with obturator hernias is speculated to increase. Elderly people with comorbidities require immediate operative procedures because their general condition tends to be exacerbated by bowel obstruction. Postoperative management may be carefully performed in patients with bowel resection because the postoperative mortality rates may be higher in these patients. YH: Acquisition of data, analysis and interpretation of data, drafting of manuscript, revision of manuscript. MY: Acquisition of data, analysis and interpretation of data, drafting of manuscript, revision of manuscript. MM: Collection of patient data. HW: Collection of patient data. ST: Collection of patient data. TY: Collection of patient data. AF: Collection of patient data. TS: Collection of patient data, revision of manuscript.